Are We Built to Be Monogamous? Apparently Not, No. The heart wants what the heart wants, and that doesn’t change just because someone’s put a ring on your finger. When all is said and done, being in a monogamous relationship is hard. Very hard. But perhaps that’s because we’re not programmed to be monogamous by nature. 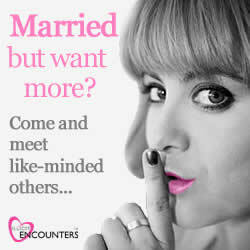 That’s certainly what extramarital dating website, IllicitEncounters.com, seem to suggest. By their reckoning, even those in a happy marriage are susceptible to cheating. Why? Well, there is no definitive answer, rather several different ones that differ on a case by case basis. You might love your significant other, but they can’t please you where it counts; whether that stems from a medical issue or not, the bottom line remains the same. Or, quite simply, people just get bored. I couldn’t eat the same meal for 20 years in a row, nor could I do the same job, laugh at the same jokes, or maintain the same, mundane daily routine. So sticking with the same partner can become very stale, very quickly, especially when life – be that work, kids or health – starts to get in the way. The answer? Well, needless to say, the aforementioned site think an affair is the way to go. Maybe they’re right.